When leaders grow, companies thrive. It’s as simple as that. We empower emerging and established leaders to push past their barriers to excellence and learn to lead with courage, conviction and clarity. Every leader, from middle managers up to CEOs, must continuously renew and enhance their relevance and the unique value they bring to their marketplace. For more than two decades, The Personal Brand Company has been developing effective, impassioned leaders through one-to-one coaching, dynamic and interactive workshops and keynote speaking engagements. Executive coach, award-winning author and keynote speaker Susan Hodgkinson is the founder of The Personal Brand Company. 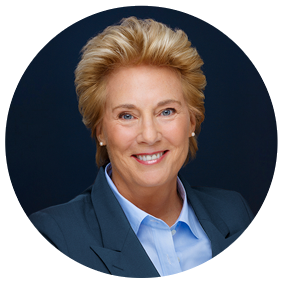 For more than 20 years, her leadership development firm has helped thousands of professionals in diverse industries become more effective leaders. Hodgkinson and her team work with talented, values-driven developing and established leaders, so by definition, their clients are diverse. Our executive coaching program helps emerging and established leaders extend their range of intellectual skills and operating behaviors to increase their effectiveness and drive personal and organizational success. Our experiential workshops on leadership brand and executive presence help clients build both, from the inside out. The process starts with accessing and honoring who you uniquely are at your best, and then bundling that into a clear, unique value proposition that drives results for yourself, your team and your organization. Principal Susan Hodgkinson’s keynotes on leadership branding and gender inclusion leave audiences inspired, entertained and ready to take action. Good Reads provides us with the opportunity to share some great articles and insights on topics of relevance to our expertise: developing your leadership brand and gender and inclusion in organizations. Check back often as we will post links to new articles as we read and learn from them and invite you to do the same. — Scott Abrams, Financial Services Co. 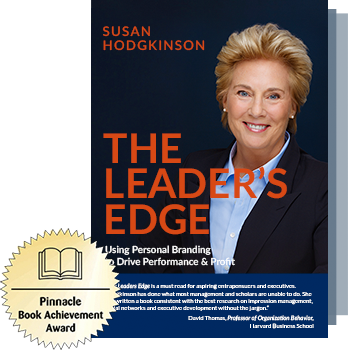 The Leader's Edge outlines a powerful approach to professional development rooted in Hodgkinson's proprietary 5 P's of Leadership Brand®— Persona, Product, Packaging, Promotion and Permission.